Monday, August 13, 2018 10:00 AM by Mike Schoonveld, Indiana North Coast Charter Assoc. When I was a youngster, few things brought thoughts of wild lands and far off places into my head than hearing and seeing a Vee-shaped skein of Canada geese winging their way south in the fall or heading back to their summering area in the springtime. If I was lucky, I’d witness this majesty two or three times each year. Nowadays, seeing a Canada goose is almost as common as seeing robins in a yard or gulls along the lakefront. 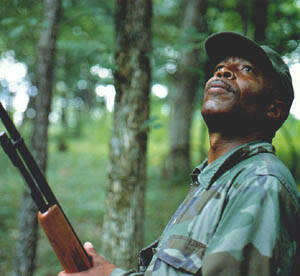 When I became old enough to hunt, my dad and other hunting companions pursued pheasants, rabbits, ducks and other game. Canada geese were legal to hunt, but I knew only a few people who had ever bagged one and fewer still who had shot one in Northwest Indiana. Nowadays, hunting and harvesting geese in this area is common place and there are special seasons set to encourage hunters and give plenty of opportunities. What happened to create the resurgence of geese in our area? It’s partly a wildlife management success story, partly a story of unintended consequences. All Canada geese aren’t the same. Though all are closely related, over time, geese nesting in distinct regions of North America began to differentiate. The differences weren’t enough to call them distinct species, but it’s easy to see a Richardson’s Canada goose which may weigh 4 pounds is very different than a regular Canada goose which weighs twice as much. One race of Canada geese historically nested throughout Indiana and much of the rest of the Midwest. It was called the Giant Canada goose because it regularly grew to 15 pounds or more. By the time the Midwest was settled, few of the Giant Canadas were still alive. Mostly, they’d gone into the pot of early settlers or had fallen victim to wetland drainage projects. By the 1950s, biologists declared the Giant Canada subspecies to be extinct. In the early 1960s a waterfowl biologist discovered a remnant population of Giant Canadas living in Minnesota. Breeding programs using the Minnesota flock as seed were started by nearly every state DNR as well as the US Fish and Wildlife Service. Indiana’s project to bring back our once native subspecies of Canada goose was headquartered at Jasper-Pulaski Fish and Wildlife Area just south of the Kankakee River. The projects were successful–many non-goose lovers would say, too successful. An unexpected consequence of reestablishing Giant Canada into the Midwest was how well they adapted to life in the city. 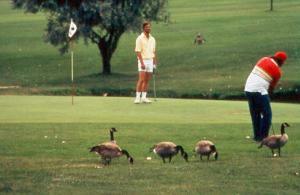 Geese on golf courses is an unintended consequence of reintroducing Giant Canadas in the MidWest. Most major cities invest in “green space” to break up the monotony of brick, mortar and concrete. Parks, golf courses and playgrounds are interspersed with houses, commercial areas and industry. Many of the green zones feature ponds and wetlands, as well. And when you plant an area with lush, green grass nearby a pond or wetland, geese love it. Most of these urban zones prohibit hunting and thus become goose refuges where natural predators are few. The unintended result is many Midwestern cities are now overrun with Giant Canada geese. Thousands live in Northwest Indiana; more than 100 thousand live in Indiana. Hunting geese in Northwest Indiana is more popular than ever. Hunting has proven to be the best way to keep the goose population under control. Some of these urban geese leave the safe zones to feed in farm fields outside city limits where hunting is legal. Seasons are set as early in the year as September first and they run almost continuously into mid-February. State and county public hunting areas such as Willow Slough, LaSalle, Jasper-Pulaski Fish and Wildlife Areas and the Grand Marsh County Park are open for hunting. Check state regulations and each individual property for exact details. In the meantime, I’ll still pause when I hear a passing flock of Canada geese flying overhead. It’s still a call of the wild - and nice to know the wild is a little closer to home.